Giraffes can clean their ears with their tongues. The Giraffe is the tallest living animal. 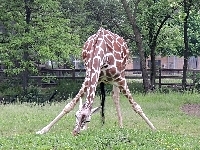 A Giraffe's front legs are longer than it's back legs. 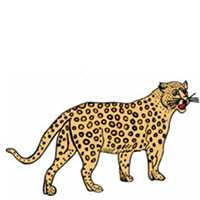 A Giraffe can kill a lion with one kick. 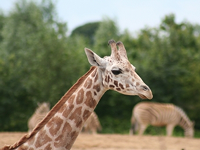 Giraffe's form herds of up to 25 animals in the wild. 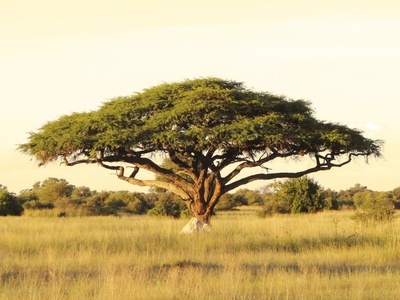 The Giraffe is native to dry African savannas. Male Giraffes are about 17 feet tall, which is about 3 feet taller than females. 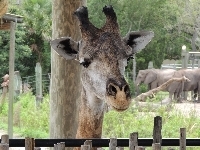 Giraffes have 2-4 horns, which are called ossicones. A newborn Giraffe stands about 6.5 feet tall. Giraffes will fight with each other with some fights lasting an entire day. Giraffes favorite meal is acacia leaves. The Giraffe's height helps it spot danger from far away. Giraffes can run at speeds of up to 35 mph. Giraffes have excellent eye sight. Giraffes usually sleep standing up because it takes them too long to get up if a predator approaches. Giraffes have the highest blood pressure of all known animals. This is needed to pump blood up the long neck. Giraffes have large hearts (that weigh up to 24 pounds) to pump their blood all the way up their neck. A Young Giraffe can grow half an inch in one hour. 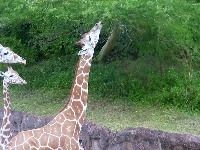 Both male and female Giraffes have horns. Baby Giraffes are born with horns. Giraffes have seven bones in their neck, the same number of bones human necks have. Giraffes have tongues that are up to 18 inches long, which is the longest tongue of all land animals. 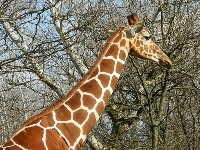 The Giraffe is one of the heaviest land animals. A Giraffe's heart can beat up to 170 times a minute (twice as fast as a human). YouTube: Baby giraffe calf nursing from mother.